Hello, really late posting today, almost tomorrow!! Had a friend and neighbor over today to make bits and bobs for her Christmas card making. She has limited supplies, so I brought my Cricut, my Big Shot and my embossing folders downstairs on the dinning room table, a stack of paper and we went to town. I had the Woodland cartridge for the Cricut that I had never used. So much fun. She left with a bag full of pieces to start her holiday cards with and was a happy camper. Today's card is for the Totally Tilda Challenge. The challenge this time is to make a shaped card. I used the Cricut cartridge, A Child's First Year to cut out the apple. 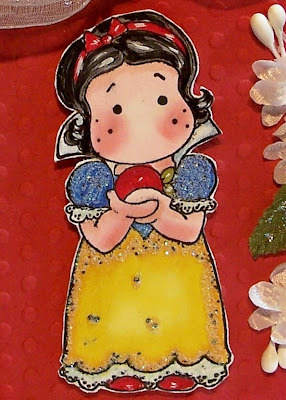 Tilda as snow white was colored with Copics. Added some small flowers. Ran the apple shape through a Sizzix Dots embossing folder. The leaves were cut from green card stock covered with embossing ink and embossed with clear embossing powers to make them shiny. Added a bow to finish it up. mirror mirror on the wall! I just love this card. I must make an apple shaped card...this is just too cute! This is so sweet, Sue! Love the apple shape, very creative card! Have a great weekend! 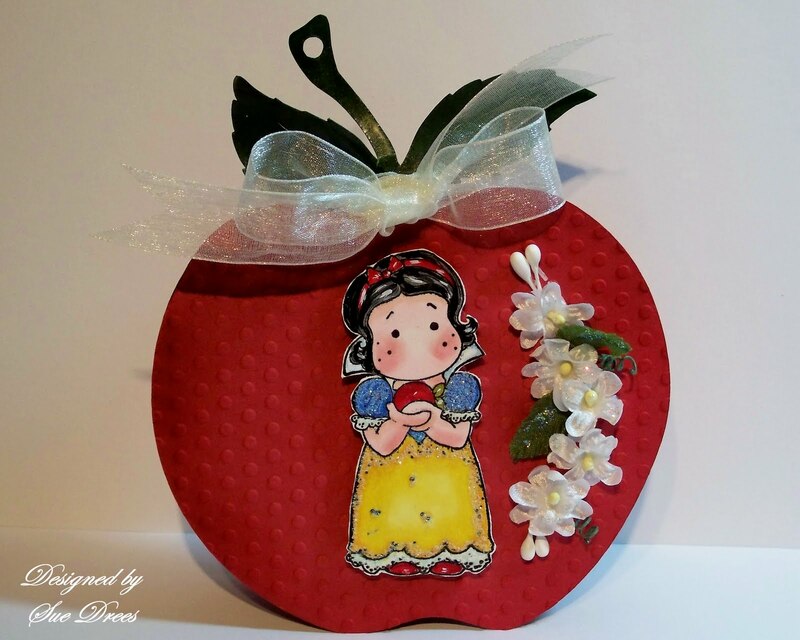 Hi Sue what a great shaped card brill idea to use the apple..gorgeous colours & Tilda..thanks for sharing & joining us at Totally Tilda chall. I sooo love the apple shaped card Sue! I love how you did Tilda with her apple...brilliant idea! P.S. Love the picture on the top of your blog of the falls! 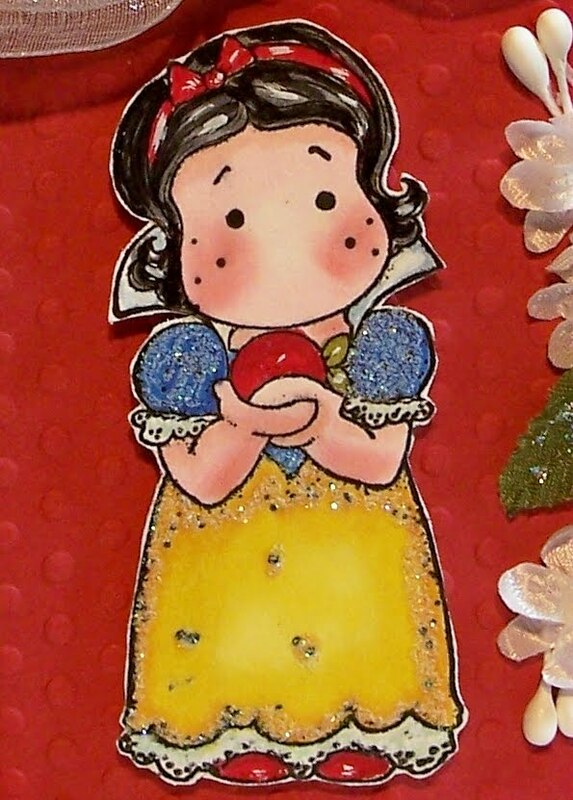 Hi Sue, what a fabulous card, Tilda looks amazing as Snow White and on an apple shaped card it's ace. Thanks for shaping up with us at Totally Tilda this time. PS Love your "Blog Dog" and your Title photo!! This is awesome. Love the apple shaped card.....goes so perfect with the image and theme! LOVE IT! Mirror mirror on the wall who made the cutest card of all! Thanks for joining Totally Tilda this week! Awwwwww, what a delightful shape, the epitome of the image, I believe, and you've coloured Tilda up just perfectly!!! Holy smokes, it is raining here this evening, FINALLY!! Oh, I am in love with this card! 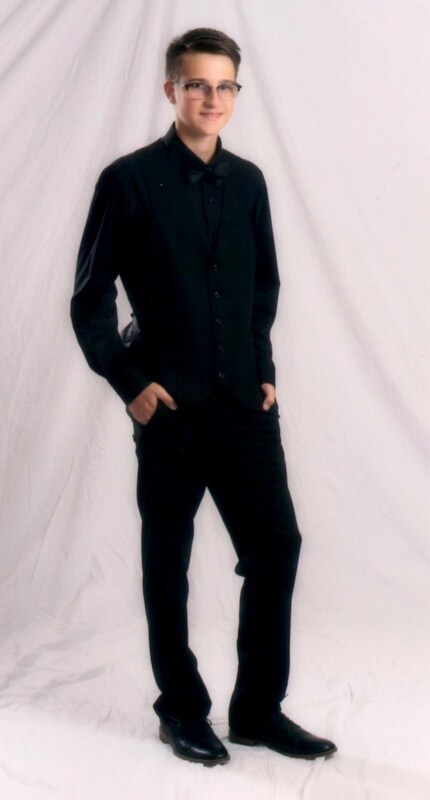 Who wouldn't want this sweetness? I see I have a lot to catch up on with all your beautiful new posts!